Buying the best value drone for your money isn’t easy. If it is your first quadcopter, then you will want a drone which is easy to fly, a drone which takes great aerial video and also has FPV (First Person View). With so many drones coming to the market, the choices can be too much. You will also want a drone with great safety features, which is easy to assemble and has plenty of support online whether in written articles, You Tube videos or directly from the companies customer support. Now, this post is quite old, so if you would like to have the latest and best drones, then also read the full reviews on the DJI Mavic 2, Mavic Pro and Phantom 4 Pro in our drone reviews section. These latest DJI drones have many intelligent flight modes which make flying and filming very easy. The Phantom 2 Vision+ has everything in one package. You don’t have to buy a separate gimbal stabilizer and camera. When buying your first quadcopter, you definitely don’t want to be confused by the many options for gimbals and cameras out there on the market. The Phantom 2 Vision+ is one package. This first video shows you how easy the Phantom 2 Vision+ is to assemble and fly. Their is nothing difficult about this quadcopter. The pre-flight checks are easy to follow. Installing the battery, twirling on the propellers, adding your smart phone to the remote control is all very easy. The Vision App on your smartphone is easy to follow. Calibrating the compass and fixing the failsafe home point is so easy. Flying is pretty easy but you got to take your time in the beginning. Get to know the controls and your quadcopter. Watch this below video. It’s child’s play for adults. Some of the best drone videos on the Internet today have been filmed with a DJI Phantom. The DJI Vision+ is the latest in the Phantom range with even more quality, extra features and ease of use for aerial filming. The Vision+ comes with an extremely high quality camera. The camera is super stable because of the integrated and very precise 3-axis gimbal stabilizer for smooth video. The camera can film full high definition video at 1080p/30 fps and 720p/60 fps, giving you crystal clear video and the option for slow motion shots. Photos are shot at 14 megapixels. The camera can be tilted to aim exactly where you want and it uses Adobe’s lens profile support to get ride of barrel distortion – making horizons look flat rather than curved because of the wide-angle lens. Watch this beautiful video filmed with the Phantom 2 Vision+. With a little practice, I’ve no doubt you can easily become a master aerial cinematographer. Watch this UNESCO Drone video over the Yangshuo World Heritage site town in China. This professional quality aerial video was filmed with the Phantom 2 Vision+. The Phantom 2 Vision+ Ground Station app allows you to to program in a flight path called waypoints. These Phantom 2 waypoints allow your quadcopter to fly on its own from takeoff to landing. You can also create waypoints while hovering in the air. This allows you to let go of your controller and focus on getting the shot you want. The Phantom 2 Vision+ flies autonomously with the programmed flight while you concentrate of filming. Impressive. The Smartphone App for the Phantom 2 Vision+ makes it very easy for you to see all the essential information on your quadcopter while flying. The Phantom 2 Vision+ has a max flight time of 25 minutes which is far longer than any other quadcopter for its price range. You’ll love flying this quadcopter so much, you’ll probably pick up a few spare batteries. Easily swap out a used battery and put in the full one. First Person View (FPV) is where you see on your smartphone or tablet what the drone sees up in the sky. It’s practically like sitting in and flying the drone. The FPV range is limited by Wi-Fi but thanks to the Vision+ controller the range is extended up to 700 meters. With the remote control you’re using real joysticks for controls. Should you fly outside the WiFi range, the Phantom 2 Vision+ will detect a signal break and automatically start flying back to you. You can easily take back control of the Phantom when it is back in range with the flick of a switch and start flying normally again. As well as the above safety features on your quadcopter, DJI also promote safe, smart flying around the world. DJI has enhanced the safety features on all their drones to include no fly zones so you won’t fly into areas or zones such as airports or military space where you haven’t been invited. Learn about these improved features in the below video. For less than USD 339.00 you have one amazing drone in the Phantom 2 Vision+. Make no mistake about this. You can take terrific aerial photos and video with this camera. But more than just travel videos, drones for site surveying are in big demand. 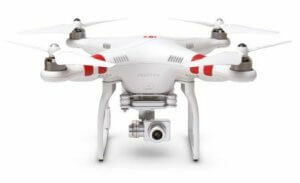 The DJI Phantom 2 range is being used to market real estate and resorts. For site surveying, the uses for drones and your Phantom 2 Vision+ is practically endless. So much opportunity. The Phantom 2 Vision+ is the best all round best value drone on the market. Let’s take a quick look to see how the Phantom 2 Vision+ is being used outside of the normal recreation flying. Helping the Fire Service: Watch how the firemen in Branford, Connecticut, used a Phantom Vision+ to extinguish a dangerous fire safely. Drones save time, money and give companies a great aerial perspective of the building sites, solar farm and construction works. Before drones like the Phantom 2 Vision+ this was only possible if your hired a helicopter and film crew a great expense. That’s why quality drones such as the DJI Phantom 2 Vision+ are in high demand. Surveying Solar Farms: One of the largest solar power producers in China, the China Merchants New Energy Group, use Phantom quadcopters to help their goal of providing green energy be more efficient and cost effective.